From millennials to baby boomers, almost everyone is affected by the opioid epidemic. While the issue touches so many people, a study done by Stericycle shows that Americans aren't as educated as they could be when it comes to disposing their leftover opioids. The study indicates that leftover opioids are proving to be a large source of this national epidemic. The study digs into people's habits when they are prescribed medications and how they usually dispose of them. It found that 74 percent of people think sharing and selling unused prescriptions is contributing to the growth of the epidemic. While a majority of Americans feel this way, the study also found that Millennials are 68 percent less likely than Baby Boomers to agree that sharing or selling their unused prescriptions is a contributing factor. Millennials also aren't concerned about sharing their leftover opioids. Compared to Baby Boomers, Millenials are more than twice as likely to share their unused prescriptions with a family member, and 33 percent more likely to have used an opioid recreationally in the last six months. While most Americans think sharing is contributing to the problem, 30 percent admitted to keeping leftover prescriptions for future use out of a fear of an illness returning. The study reveals that 15 percent of these people hanging onto their medication are doing so because they don't know how to dispose of them. 68 percent of people agree that having access to safe and secure disposal methods would help the epidemic, but 83 percent admit they have never participated in these available programs. While the need for programs like this is evident, the study shows that tackling a problem like this it isn't so simple. "Solving opioid addiction in America is a complex issue. But preventing prescription opioids from getting into unintended hands is an important and overlooked step in the fight against the opioid epidemic," said Charles Alutto, CEO of Stericycle, Inc. "The only way to do this is for companies to join healthcare workers, government, community activists and addiction specialists in creating policies and programs that prevent prescription opioids from going beyond the intended patient. This study shows that consumers need more education on how to handle and dispose of leftover opioids, and this is another critical step that communities, medical professionals and lawmakers should consider to help stop the spread of opioids." 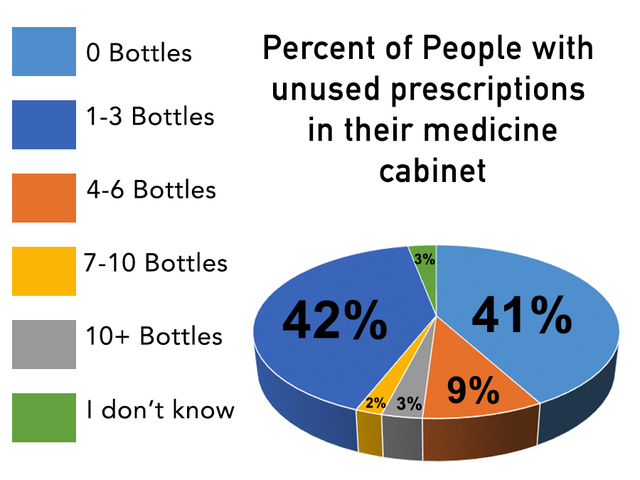 78 percent believe their pharmacy, hospital, or doctor should help collect the unused prescriptions. The study also showcases that disposal programs are also increasingly important because of the environmental harm flushing and throwing out unused opioids is causing. Despite a majority of Americans saying they are concerned that flushing painkillers could pollute their drinking water and waterways, half admit to flushing or throwing them out. Overall, the study shows alarming information about the patterns of the opioid epidemic and shows that America has a long way to go to fixing the problem.